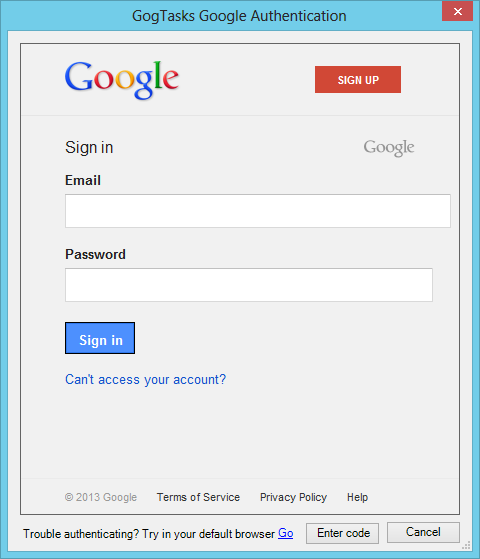 This will open an in-app browser window which will navigate you to Google's authentication pages. 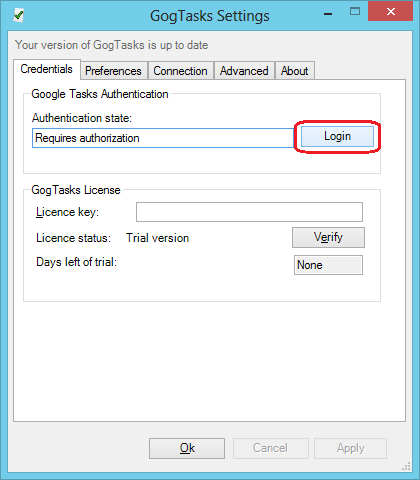 Follow the on screen instructions to log in and associate a Google account with GogTasks. Enter your credentials and click log in. (The instructions will be in your language). 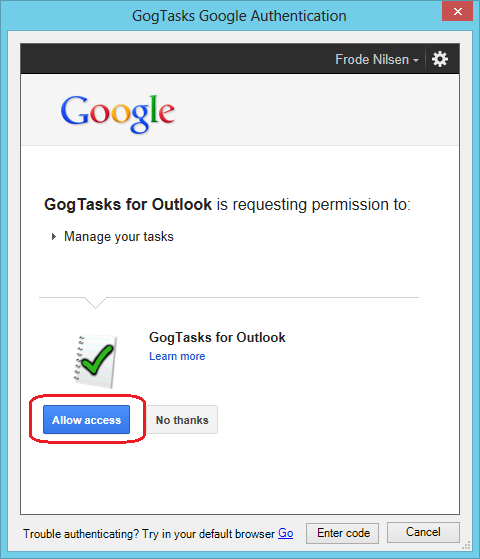 Confirm that you want to associate your Google account with GogTasks. 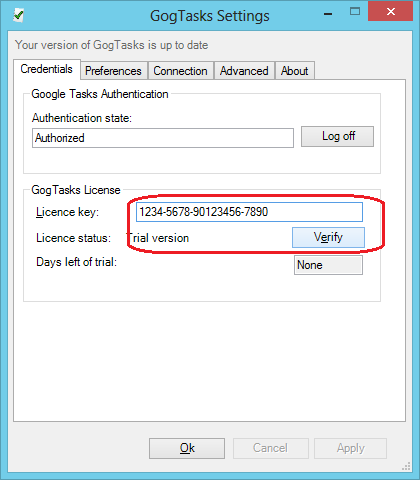 Note that if for some reason this procedure fails, there is a backup solution by using the link at the bottom of the form saying "Go" followed by entering the pin code given by Google manually by clicking "Enter code"
If you have a license key, proceed to enter it in the license key field and click Verify. This will remove the 30-day trial limitation. 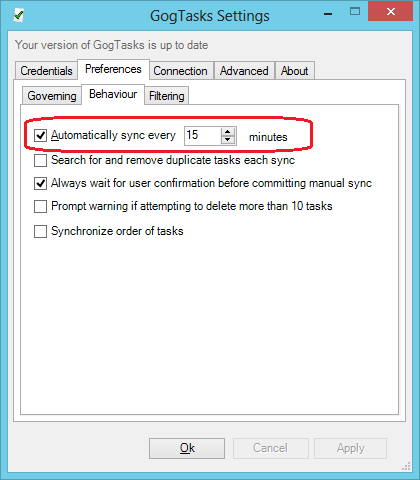 When you're done, you can try your first synchronization by closing the settings form and clicking "Synchronize now" from the tools or add-in menu illustrated at the top of this article. 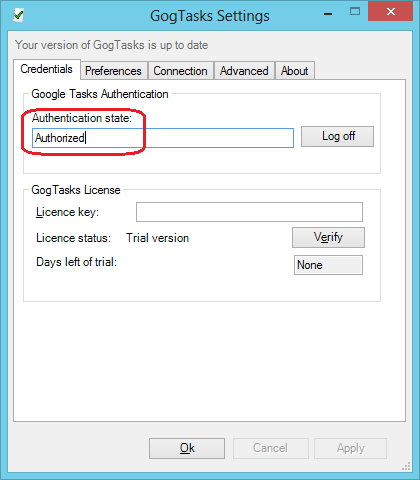 You can also make GogTasks synchronize automatically at regular intervals. This is set up this under Preferences > Behaviour. This can be useful if you prefer manual sync. You can set this up by going to the menus File > Options > Quick access toolbar, select "Add-ins" from the "Choose commands from"-dropdown, and add "Synchronize now" to the toolbar. If you're having trouble getting synchronization working, please read the Performing a test run article, which describes step by step how to test synchronization in trial mode.